The majority of young vineyards have been planted on flat land, even though antiquity tells us that the reign of Bacchus was in the hillside vines! Flat lands are more accessible, allowing tractors to pass from row to row at ease. Flat land is more fertile and it offers the chance of more grapes for less work, however the quality of hillside grapes is almost always superior. 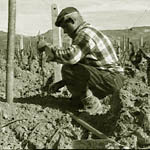 Vine planting takes place in January and February. Contrary to many other vine growing regions non grafted root cuttings are predominantly utilised in the Ciro' area. The Gaglioppo and Greco Bianco are grapes that are very specific to this area and it would prove almost impossible to find grafted root cuttings of this type. The climatic conditions of the Ionian coast deny the need of drainage within the vines, however, when the rain occasionally arrives it does so fiercely. Roads become rivers and the water forms deep gulleys in the hillside. On a steep unterraced hillside it is necessary to plant a vine in the direction that the rain water flows, otherwise the consequences are that the vine will be uprooted. A hole of about 40- 50 cm deep is made with a forked pole, next the wild vine is placed in the fork and inserted in the hole. With the pole the soil is made compact around the roots. 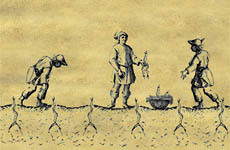 Next the soil is gathered around the vine and subsequently the vine is lightly covered with soil. A small cane is placed by the vine as a marker. Alongside a vine pomigranites, olive, almond, fig and kumquat trees are often planted.